Mill-Max series 117, 127, 217 & 227 shrinkDIP sockets accommodate memory chips and components which have pin-to-pin spacing of .070" (1,778mm). The reduced pattern of the shrinkDIP series also saves valuable board space for board-to-board connections as more pin connections can be made using less "real estate" than standard .100" pitch patterns. They can also be mated with series 162 shrinkDIP headers for board-to-board connections. The Mill-Max series 317 & 327 single-row "shrinkSIPs" are an ideal solution for most microelectronic applications. 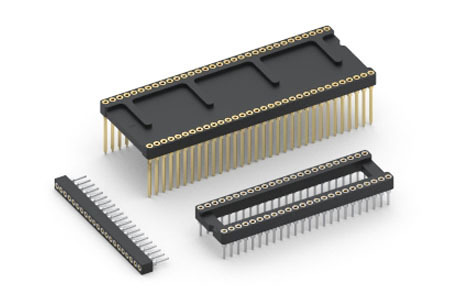 Mated with series 862 headers, they save critical board space when connecting two small boards together. Available in both through-hole and surface mount, the Mill-Max shrinkDIP and shrinkSIP series sockets and headers are the perfect solution for today's products where designs are continually pressed to become smaller and smaller.